The New York Mets were running out of time. It was the last Saturday of the season and they faced elimination from the postseason for the second straight year. The Philadelphia Phillies clinched at least a tie with the Mets by defeating Washington, 8-4, the night before, while the Mets’ 6-1 loss to the Marlins left them one game behind the Brewers for the lone NL wild-card spot. The Mets had a difficult decision to make: whom to pitch in the crucial game. Manuel had two choices and neither one was easy. He could send Jon Niese to the mound. Niese had just three major-league starts under his belt. He had been shelled in his last start, giving up seven hits and six runs in just three innings. After getting leadoff batter Hanley Ramirez to fly out to right field, Santana struck out John Baker. Jorge Cantu singled but Santana got Josh Willingham to ground out to end the inning. It took Santana 20 pitches to get the first three outs and many in the crowd were likely wondering how long he might last if this continued. Ricky Nolasco, the Marlins’ winningest pitcher in 2008, started for Miami. He had garnered just one win in five appearances against New York that season. The Mets wasted no time in giving Santana a lead to work with. Jose Reyes singled and stole second. He moved to third on Carlos Beltran’s single and came home when Carlos Delgado hit a sacrifice fly to center field. It would turn out to be the only run Santana would need. Nolasco matched Santana, keeping the Mets in check as he struck out four of the next six batters he faced in the next two innings. In the fourth, he picked up his fifth strikeout when Wright was caught looking. But then Nolasco hit Daniel Murphy on a 1-and-2 pitch. When Ramon Martinez blasted a double to deep center field, Murphy came home. The Mets were now ahead 2-0. Meanwhile Santana took control of the game and didn’t allow another hit by the Marlins until Cody Ross singled in the fifth. When Santana gave up his second walk of the game, to Jeremy Hermida, Nolasco dropped a sacrifice bunt in front of home plate that pushed Ross to third. But he stayed there when Santana got Baker to fly out to right field for the third out. It was the closest any Marlins runner would come to scoring all afternoon as Santana got the Marlins out in order until the ninth. As the Mets batted in the bottom of the eighth, the crowd saw that no one was warming up in the bullpen. By this time Manuel had stopped looking at the pitch count and allowed Santana to finish the game. When Santana ran onto the field for the ninth inning, Shea Stadium erupted in cheers and fans began shouting his name. Santana was, in the words of Scott Schoeneweis, “incredible, superhuman. A machine, a relentless machine.” After the game, Wright asked Omar Minaya, the Mets general manager, “Can he pitch every day?” perhaps realizing that the Mets chances were hanging on a thread.8 When the Marlins beat the Mets the next day, it was the second consecutive year that Florida extinguished the Mets playoff hopes. In addition to the sources cited in the Notes, the author used Baseball-Reference.com and Retrosheet.org for box-score, player, team, and season information as well as pitching and batting game logs, and other pertinent material. 1 Ben Shpigel, “After Odds Grow Longer, Mets Turn to Short Rest,” New York Times, September 26, 2008. 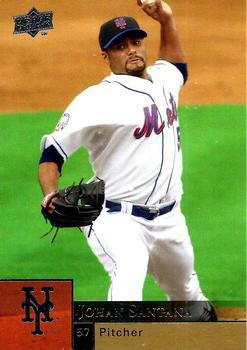 4 Ben Shpigel, “With Santana in Role of Ace, Mets Draw Even for Wild Card,” New York Times, September 27, 2008. 5 Clark Spencer, “Mets Preserve Playoff Hopes With 2-0 Win Over Marlins,” Miami Herald, September 28, 2008. 9 Ben Shpigel, “Santana Pitched With Injury to Knee,” New York Times, October 1, 2008.